HNN: … the state's newly imposed $35 million per year cap on the tax credits …. The state's film tax credit program refunds production companies a portion of what they spend to film in the islands. On Wednesday, Senate Bill 33 and Senate Bill 365 were heard in the House Finance Committee. The bills would change the current cap. “We are looking at whether it is time for us to increase the cap amount or what is the reasonable amount that the state can afford,” said Rep. Sylvia Luke, House Finance Committee Chair. SB33 passed with amendments and SB365 passed un-amended. It now goes to the entire House for a vote. If that passes, the House and the Senate will then negotiate the differences and determine what the cap amount would be. But some say the cap should be abolished entirely…. Vans Stevenson, with Motion Picture Association of America flew in from Washington D.C. to testify on the bills. He said Hawaii has proven to be an attractive location for television and motion picture production companies because of its landscape and also wants the cap to go away. “Our companies, the major motion picture studios and television companies are very interested in doing more production in Hawaii,” Stevenson said. “And to do that today, you have to have a competitive production incentive program and Hawaii has a productive incentive program in place, but it needs to be more competitive." Motion Picture Association of America members include Disney, Fox, Netflix, Paramount, NBC Universal, Sony Pictures, Warner Bros, and CBS…. KITV: … But there is concern some ballots are being sent to the wrong people, including those who no longer live in the district or even those who have died. Stephanie Spangler came to Honolulu Hale with her special election ballot in hand because she didn't want to mail it in. "If you look on the envelope you see you have to sign your name and that goes straight into the mailbox. So anyone who wants to lift those ballots to get signatures can really use those," stated Spangler…. Quidilla said if there are problems, like a husband signing his wife's ballot and vise versa, they will be sent a notice so they can correct their ballot and still make it count…. CB: … The balance of power in the City Council is now evenly divided, with four members siding with Mayor Caldwell and four members voting to hold him accountable. The winner of this upcoming special election will represent the key vote that will either strengthen or stall the mayor’s agenda. The two choices you have could not be more different, and it’s important to understand what your vote means. Tommy Waters has been the staunchest Caldwell ally since their days together in the state Legislature. The mayor has campaigned tirelessly for Waters. You may have seen the recent news that the Waters campaign has outspent the Ozawa campaign by over three times. That’s because Kirk Caldwell is personally directing massive funding from his friends, business associates and special interest groups into the Waters campaign account. A mayor who makes over $250,000 a year from a part-time gig at a local bank will have impressive financial resources…. KITV: … Hiking rates for TheBus and Handi-Van users is causing an emotional debate at the Honolulu City Council. The Council is considering Bill 77, which would increase bus rates for adults, seniors and people with disabilities. Adult bus fares would increase 25 cents per ride. Handi-Van fares would jump one dollar. Council's Budget Committee was met by a room full of people in opposition Wednesday. Donald Sakamoto, who opposes increasing bus fares said, "It's very hard for people who are on dialysis, people who are on a fixed income, to get around on a $3 increase. That's a 50% increase." Wednesday, the Budget Committee postponed taking any action on the bill…. HTH: … The majority of the proposed new hires, 42 in all, are for the Police Department. That was Kim’s priority for the fiscal year that starts July 1 after hearing numerous citizen complaints about crime. Their salaries and benefits will come from the general fund, which is backed mostly by property taxes…. Of the other position increases, a hike in sewer fees is expected to pump up the Environmental Management Department’s Wastewater Division by 10 employees — six in Kona and four in Hilo. Positions range from sewer plant operators to engineers to analysts and a program manager. Four new positions in the Mass Transit Agency are in accordance with recommendations from a mass transit master plan that was completed last year. The positions, an administrative services assistant, garage supervisor, automotive mechanic and a temporary account clerk, are expected to be paid from the county general excise tax surcharge. Seven new positions are in store for the Planning Department, to enforce the county’s new transient vacation rental ordinance. The positions, including three planners, two planning inspectors and two land use plans checkers, will be paid from a new account subsidized by vacation rental application fees and fines, estimated for the 2019-20 fiscal year at $846,000. The Department of Parks and Recreation could get six new positions, including one park caretaker each for Hamakua, North Kohala and Puna, as well as a recreation technician for Puna and a clerk and an account clerk in Hilo. Kim said Parks and Rec staff increases are needed because of an increase in the number of parks and also because more maintenance is needed to clean up debris left by homeless campers…. CB: … While the proposed constitutional amendment was ultimately invalidated before the election by the Hawaii Supreme Court for its vague wording, it stirred up intense debate over the adequacy of public school funding in Hawaii that left many people wondering how it would shape future talks. 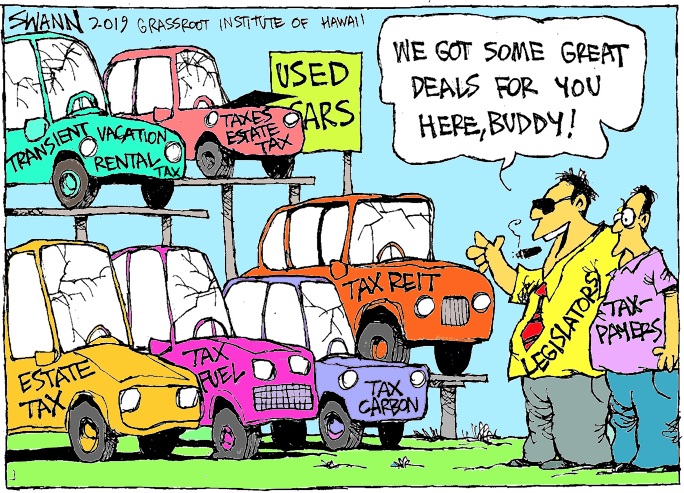 …One casualty this session — and perhaps the most analogous to the constitutional amendment as far as raising more money — was a Senate bill to increase the general excise tax by 0.5 percent to steer additional funding to the Hawaii Department of Education and the University of Hawaii. The idea, which has been floated before, was a long shot from the start. The bill did cross over from the Senate, but will not get a hearing in the House, Sylvia Luke, the House Finance Committee chair, decided…. The push for more transparency has also produced Senate Bill 856, which calls for a financial and management audit of the DOE by the state auditor every three years. The measure is set to be heard by the House Finance Committee on Friday. Such an audit “would help the state determine exactly what kinds of costs are needed to help with our schools’ infrastructure and student needs” as well as “more accurately inform further action by the Legislature to improve our schools,” the Chamber of Commerce Hawaii, which opposed the constitutional amendment, said in written testimony. Aside from one other bill to appropriate money for repair and maintenance of DOE buildings, it’s the only education measure the chamber is supporting this year…. CB: … Florence Puana, an alleged victim and key witness in the U.S. Justice Department’s corruption case against former Honolulu police chief Louis Kealoha and his prosecutor wife, Katherine, has fallen ill and might not be able to testify at their upcoming criminal trial. Wheat’s team now wants a federal judge to authorize an immediate deposition of Puana, should her condition worsen, so that her testimony can be used at trial even if she’s unable to attend. …. MN: … More people with mental health issues are showing up in the courts and in the community, increasing the need for police officers and others to be trained to approach mentally ill people in crisis, officials say. “It’s extremely important for us to have access for these officers to get trained so the consumers receive the best service possible,” said Dr. Dara Rampersad, who led a weeklong Crisis Intervention Team training that concluded with a graduation ceremony Friday at the Kihei Police Station. Over the past year, he said, increases in methamphetamine and opioid abuse have been reported at Maui Memorial Medical Center, along with reports of more homeless people with mental health issues in the community. Police made 92 calls to mental health emergency workers when encountering people who were refusing to go to mental health treatment over the past year, Rampersad said…. She said some defendants are arriving on Maui with one-way tickets from the Mainland…. MN: … A highlight of the sixth annual Hawaii Energy Conference and Exhibition at the Maui Arts & Cultural Center was Hawaii Public Utilities Commission Chairman James “Jay” Griffin and California PUC President Michael Picker signing a memorandum of agreement before a Castle Theater audience. Griffin said the agreement signals a new chapter in communication and will enhance information and resource sharing, a big boost for Hawaii, especially because California is an energy industry leader. “Symbolically, we, like our leaders in state government utilities, are pledging to work together for a cleaner future,” Griffin said. “But practically, the agreement will help us share resources between the commissions — particularly for ours, there is a huge benefit here. HTH: … A Hawaii airports corporation might finally be approaching takeoff as a bill that aims to improve the efficiency of the state’s airports passes through the Legislature. Senate Bill 666 is the fourth iteration of a bill intended to streamline airport-related decisions by shifting authority over the state’s airports from the Department of Transportation to an independent airports corporation. Similar bills had been introduced and abandoned in the Legislature each year since 2016. Now, however, SB 666 passed its final committee in the state House of Representatives and now must only pass third reading in the House before a final vote. The corporation would assume management of all seven of the state’s commercial airports. Centralizing responsibilities for the airports would allow decisions, particularly construction-related ones, to be made much more efficiently, say proponents of the measure…. Can Singapore Solve Hawaiʻi's Housing Shortage? "WHAT DOES HAWAI`I HAVE IN COMMON WITH WAR ZONES?" Why The Adulation For Michael Jackson — Or Dan Inouye?